Family Tree DNA has launched their annual holiday sale with some great discounts on most of their popular tests. Discounts of range from $10 to $70, depending on which test you purchase. The discounts are shown in the picture below. This is a great opportunity to get your feet wet using DNA to enhance your genealogy. The Family Finder is probable the most popular to start with since it is an autosomal test that both males and females can take. This test will break down the ethnicity in your heritage into percentages (for major groups like Western Europe, Irish, Jewish, Scandinavian, African, etc.). It also gives you matches to family members (distant cousins) that share your DNA. This tool is also used by adoptees who want to get a sense of what their previously unknown DNA heritage looks like. 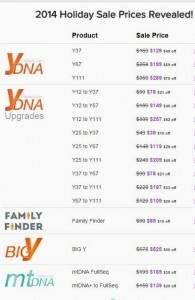 The Y-DNA test is for males only to help solve mysteries along your direct paternal line. The mtDNA test is for both males and females and traces your direct female line. I would recommend the full sequence mtDNA test which is the most useful for genealogy whereas the mtDNA+ is more for a deep ancestry analysis. Family Tree DNA is also running a new special this year called the “Mystery Reward.” If you sign up for their emails, they will send you an additional coupon each week for a test which could be up to $100 off! My first email gave me coupons for an extra $10. The coupons are only good for one week though so you have to use them or lose them. 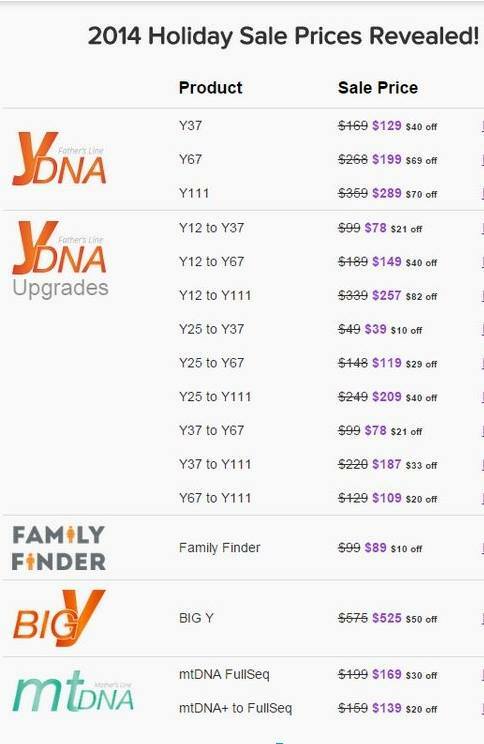 The whole sale runs through December 31, 2014 so you have a bit of time in case you need to contact some other family members to take DNA tests (such as a uncle to take a Y-DNA test on behalf of a female family member).